Noctua has today unveiled its new NT-H2 thermal compound as well a new cleaning solution with the NA-SCW1 cleaning wipes. 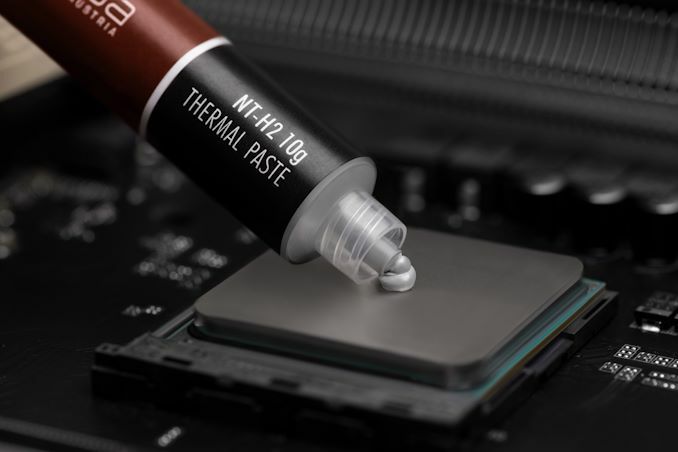 The NT-H2 looks to improve upon the already existing NT-H1 thermal paste with a new chemical structure and zerocuring time. The new Noctua NT-H2 thermal compound builds upon the previous success of the NT-H1 material with a new blend of metal oxide microparticles for an improved and lower thermal resistance. The lower bond-line thickness with conventional mounting pressures allows for less air cavity concentration which should provide better thermal conductivity between the heatsink plate and the heat spreader. As with the Noctua NT-H1 compound, the new NT-H2 doesn't require a curing period and Noctua state that an application of NT-H2 can be used effectively for up to 5 years on a CPU. Noctua, as per their own in-house testing, determined that the NT-H2 operates up to 2°c lower than NT-H1. The NT-H2 is also non-corroding and non-conductive so there's no risk of short-circuiting components and is suitable to use with all types of heatsinks including copper, aluminium and nickel plated. Noctua has released the NT-H2 thermal paste in two different packages; a standard 3.5 g and larger 10 g tube. Packaged with the smaller NT-H2 3.5 g paste is three new NA-CW1 cleaning wipes while the larger NT-H2 10 g will come with ten. The new Noctua NA-SCW1 cleaning wipes are designed to clean CPUs, GPUs and the contact surfaces of heatsinks. Each individual wipe is moistened with a custom detergent mixture for enhanced cleaning capability, but Noctua hasn't highlighted which materials have been used. Noctua's NA-CW cleaning wipes are available seperately in packs of 20. On the back of the NT-H2 announcement, Noctua has revealed that it will be launching its NT-H1 thermal compound in a new 10 g package which is set to retail for 14.90 USD/EUR; the existing NT-H1 3.5 g costs 7.90 USD/EUR. There is currently no indication whether or not the new NT-H1 10 g package will include the cleaning wipes. The new NT-H2 3.5 g will cost 12.90 USD/EUR with the 10 g package will cost 24.90 USD/EUR, while the NA-SCW1 20 pack of cleaning wipes will retail for 7.90 USD/EUR. All of these are set to hit Amazon channels within the next few days, while the stock is set to filter through to partners and retailers shortly. I hate RGB, but I do water cool and overclock. I do use high end pastes and TIMs, with the exception of liquid metal. I used to use it, but no longer. That's another story. I don't do extreme OCing as in liquid nitrogen. I do enjoy dialing in the clock speeds to see how far I can go. Better pastes are worth it to me. They do generally make a few degrees difference. This depends as well. With lower TDPs, we also have a plethora of smaller form factors and with that often comes smaller and less performant cooling solutions. Higher quality TIM may still be important in this case. There is also the philosophy that even with a monstrous cooler you don't want your cooler held back by using a peanut butter class TIM. "The new Noctua NT-H1 thermal compound builds upon the previous success of the NT-H1 material..."